Italian black metal band Graveworm is one of the longer serving acts in the metal business. Their debut came out in 1997, and was followed since then every two years with a new album, which makes Diabolical Figures the meanwhile seventh record of the sextet. Without losing any time, Graveworm start out fulminantly with their opener Vengeance Is Sworn and show how powerful black metal has to sound. The vocals are kept quite raw throughout the album, but the keyboards allow for some symphonic and grandiose moments, definitely a welcome variation. Occasionally their tracks get a certain gothic touch, which is most obvious on the title track. Fierce riff attacks happen more often, and can be savoured especially on Architect Of Hate. Other pieces are kept more in a mid-tempo pace, which also works well for the band. Forlorn Hope offers next to the regular metal parts also some more atmospheric moods. Their cover version of The Police’s Message In A Bottle is a little more controversial. Intended as a club hit, it could have become more pop-like for my taste. 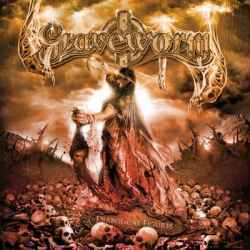 Graveworm’s new album is a good but certainly not outstanding black metal album. You get the idea that they have run out of ideas, because new impulses are hard to find. At least there are no failures either (apart from the superfluous outro), so that Diabolic Figures turns out eventually as a solid black metal record.